Before the LA Auto Show opened the doors to the main exhibit halls and let the sweaty, writhing, shrimp-starved mass of auto journalists stumble in, I took a quick look around the outer fringes of the show and saw something interesting: a three-wheeled car that reminded me of an Elio, but without the grim haze of miasma and probable failure hovering around it. It’s called the Sondors Electric Car. Regarding the reality of the car, here’s what I was told: the car in the picture there is a first prototype, made with $1 million of crowdfunded money. There’s a new fundraising effort underway to generate $2 million, which they say will go to building a production-ready prototype. The man behind all this is the hilariously named Storm Sondors, who sounds like he should be pulling off a gauzy shirt on the cover of a romance novel about love on the Adriatic Sea, but is actually an entrepreneur with Asperger’s syndrome who’s been featured in Forbes, and other publications and started one of the most successful e-bike companies today. So, compared to Elio, there’s some big differences: they seem to have money and/or the ability to raise money, and the founder is already manufacturing a vehicle of some sort. Also very different from Elio is the fact that I was told that Sondors would take no pre-orders until the cars were actually in production. That’s something I suspect many Elio pre-orderers might look at with a wistful sort of longing. Sondors wants to sell the three-wheeler for $10,000. 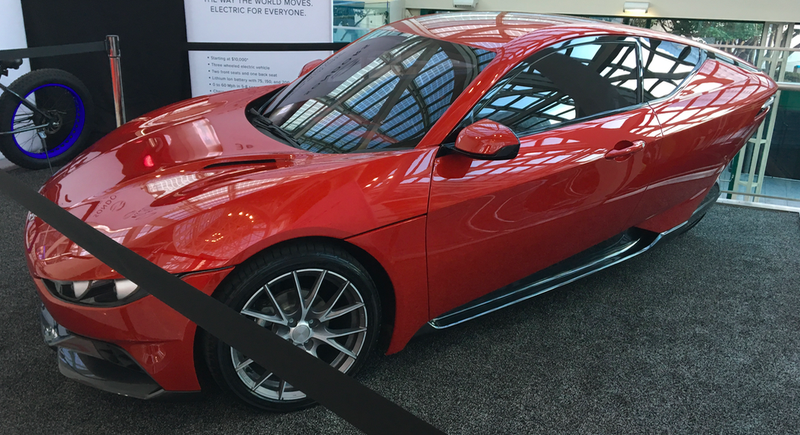 The big signs in their booth suggest they’ll have lithium-ion battery choices to give 75, 150, or 200 miles of range, and that the car will go from 0-60 in somewhere between 5 and 8 seconds. All these specs seem reasonable. The prototype I looked at was quite nicely built and well-finished. It’s drivable (I was told), and had a real, well-appointed interior, with seating for three (two front, one rear). It’s got a rear-mounted electric motor, and I was told the production version would have a front trunk, though this proto does not have a finished storage area there. I think the design is cleaner and sleeker than Elio’s, and the build quality seems a good bit better than the Elio prototypes I’ve seen up close. The use of an electric motor instead of a re-engineered Geo Metro motor as on the Elio I think makes a lot more sense: they’re planning to buy the motors, not develop their own (as Elio did/is doing with their ICE engine) and an electric drivetrain is a lot simpler. Then again, this is one car. One. Of course, it’s not in production yet, and nothing is guaranteed at all, ever. This may never come to market. But, then again, maybe it will? Who the hell knows. At any rate, it’s interesting to know people haven’t given up on the sleek affordable three-wheeler thing, and an electric makes a lot more sense in 2017 than other ones we’ve seen.